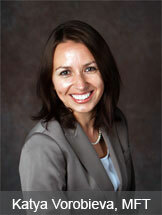 Katya Vorobieva, MFT is California Licensed Marriage and Family therapist. She graduated from Golden Gate University, San Francisco in 1999 with Master's Degree in Counseling Psychology. Ms. Vorobieva completed her internship with Community Behavioral Health in San Francisco diagnosing and treating adults with severe mental illness. She continued her work in the field with Family Services Agency of San Francisco providing psychotherapy services to adults and older adults. Currently, in addition to private practice, Ms. Vorobieva holds a position of Mental Health Specialist at On Lok Lifeways, a PACE program that provides comprehensive services to senior adults. In her capacity as Mental Health Clinician, Ms. Vorobieva provides trainings to professionals on subjects of depression and anxiety, behavior management, crisis management, dementia and many more. She also made presentations on the subject at professionals conferences in Las Vegas, NV and Oakland, CA. For more than 10 years, Ms. Vorobieva has been helping her clients overcome symptoms of depression, anxiety, panic, grief, insecurity and other intrapersonal issues. Katia works with couples struggling with communication, fidelity, boundaries with in-laws, lack of intimacy and loss of sexual desire. Katia counsels divorcing or divorced couples on the subject of co-parenting. She also helps parents and their children correct problematic behaviors, re-establish family roles and strengthen personal boundaries.